Description: A portion of Young�s map of Florida showing the extent of St Johns County in 1827 extending from the St Johns River west to the mouth of the Suwannee River and south to the Florida Keys. 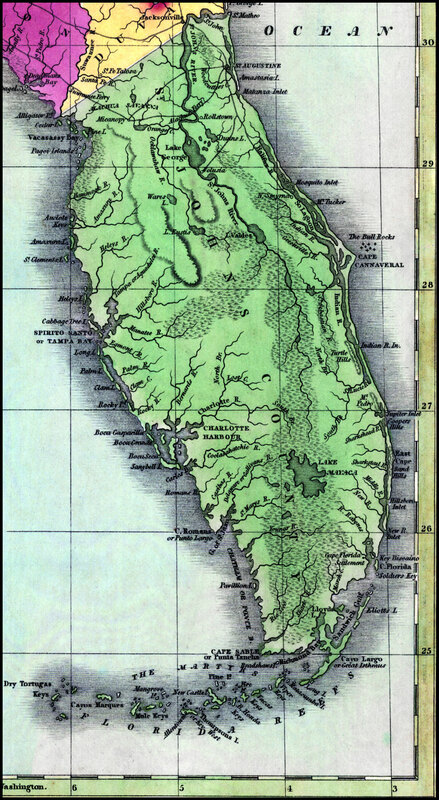 There are several interesting period references on this map, including Lake Mayaca (Lake Okeechobee), Sandwich Gulf (Card Sound), and Thompson's Island (Key West), as well as unique spellings such as Cape Cannaveral and Spirito Santo (Espirito Santo or Tampa Bay). Digitization provided by the USF Libraries Digitization Center. Rare Maps. This is a hand-colored map of St Johns County showing the cities and towns, inland waters, railroads, etc, circa 1827. Scale [ca. 1:3,168,000].